I saw this kit at the toy store on making a geyser so of course I had to plan a lesson around geysers. When I was 8 my family traveled to yellow stone so learning about geysers wasn't just for K.
I was trying to think of a fun way to make a number dial to work on place values. I simply wrote the numbers 0-9 on each cup and than added a zero/s behind depending on which cup/place value. I wanted something that I could call out a number and he could easier move like a dial that didn't take too much time to play. This is perfect on the go as well. I can call out the number and he can just show me in the mirror. I made cups all the way up to the thousands. I like that I can review number sense and place value all at the same time and son has fun reviewing. Takes 2 minutes to make and takes 2 Min's to practice a few numbers. We are covering fractions currently. I love to teach math in a way that son is able to grasp the material both from hearing what I am saying but also visual and hands on. When I first asked K which part was bigger the 1/2,1/3 or 1/4 he said 1/4. Without seeing anything he thought umm 4 is bigger than 2 and 3 so must be 1/4. Than I drew it on the board and now he was able to see it. When I drew it out is started his brain into thinking how could he be wrong; 4 is more than 2 and 3. Than I asked what was smaller and he said 1/4. Why? Because, you had to take the same size cake and cut it into 4 parts not only 2 parts,which makes each part smaller than just half of the cake. Here is K reading his daily 5 book. Yes, I stole the idea of the daily 5 from some really amazing public school teachers. I use this time to teach K that he can read to himself quietly. When he's reading I am getting things for school ready for the day or reading myself. We just started this 2 weeks ago so we are still in the learning stage. One thing that son loves is that he can read ANYWHERE at our house. When the reading to self is mastered (when we reach 20 Min's) I will start to introduce other area's of the daily 5. Year after year, I have tried different methods and planners for school. The planners that are sold in stores just didn't seem to work all that well for me. 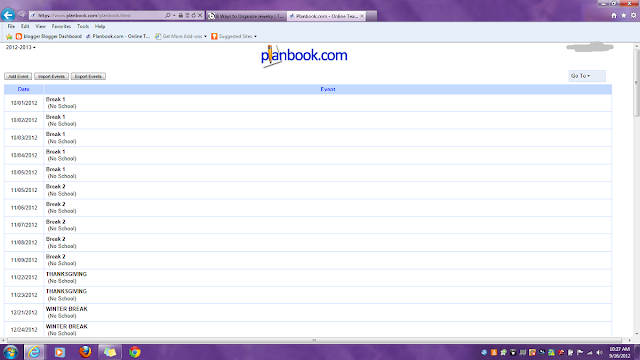 Not enough space for all the details I wanted to put in my planner. 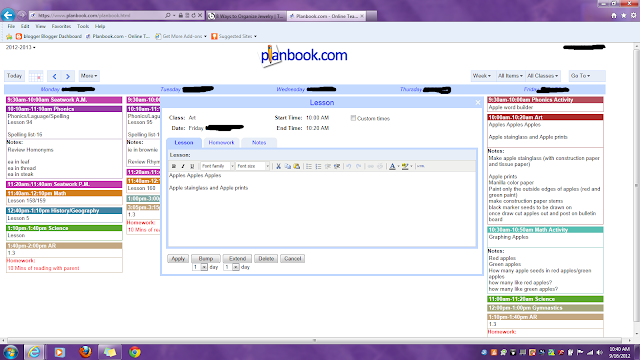 Well, for me it's so much easier for me to type out my plans than writing them out. I came across planbook and have been in love ever since. One feature that I LOVE is that if something comes up such as a sick day I can just move the lesson to another day or another week,whatever works for us. When you move a lesson all the lessons that followed also move. So basically you don't have to worry about teaching out of order just because you missed a day or two; or having to earse everything and write it out again. 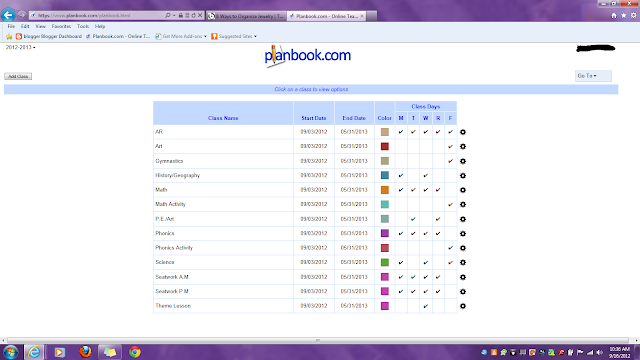 On this screen you can see your lessons by the day,week or month. I find it nice to view our schedule in the week format. I also like to have the times (start to finish) with each subject on our schedule. 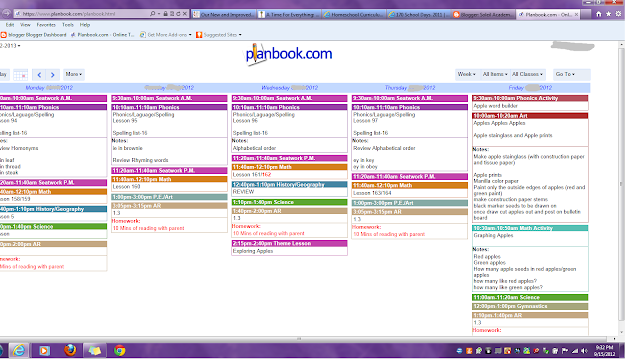 There are lots of options within the program to make your planner work for your needs. This helps me to see what we need to get done with a quick glance. When the week is over I can just put print and add it into my teachers binder for future reference. This page shows the different subjects (our core) that we are currently covering. Right not I only have the 1 student so I can leave the colors as they are. However, as we have more kiddos joining the school ranks I will just continue on with my color code system; which I have started to teach myself this year. My 2nd grader is my green student so all of his subjects will all turn green once another child is homeschooled. When planning more than one grade level you can just add different subjects and grade level or students name next to subject. This helps so you know which student should be working on what area of study. This is the page that I can enter all our PLANNED breaks through out the year which will automatically put these dates into our calendar. 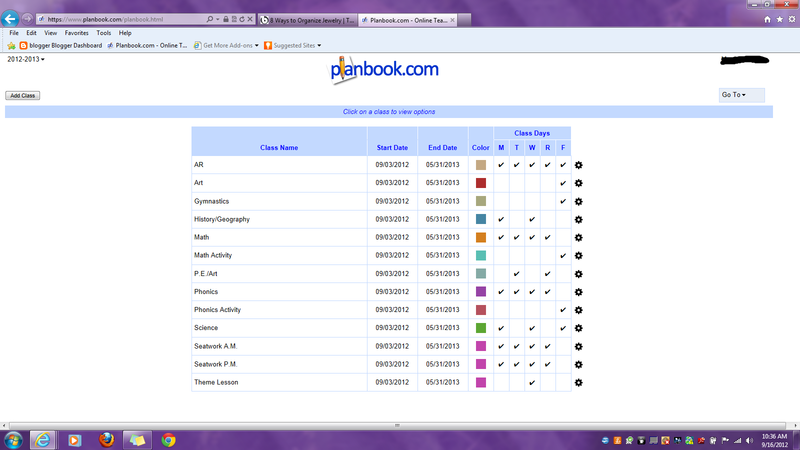 This is where I can also add field trips and all our lessons will get bumped to the next day. Which in turn leaves little work for me to do in the long run. 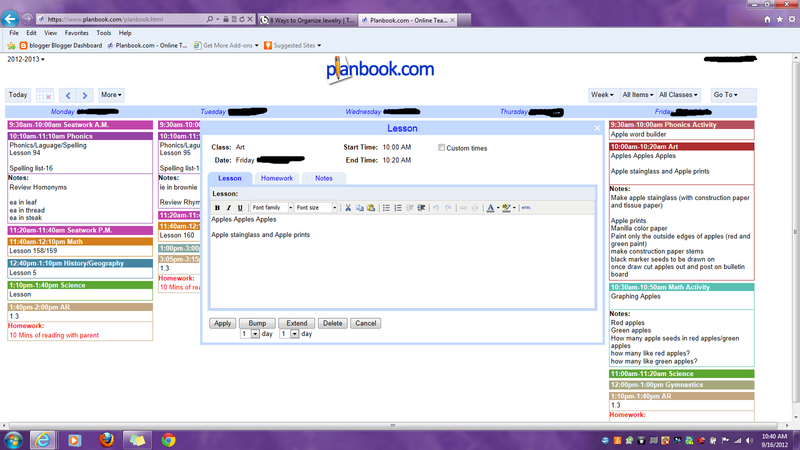 This is what a lesson plan edit screen looks like. You click on what lesson you want to edit and this screen pops up. You can write out your lesson however in depth you want. I don't put much under lessons, just a basic title. In notes is where I will post the link of my source if I got an idea online or a book w/ page number. This is also where I will write the supplies needed. There is a homework tab as well if you want to give homework. I don't give homework all that often being a homeschool family, only if something doesn't get done or I want student to work with a friend/sibling or the NON-teacher parent. 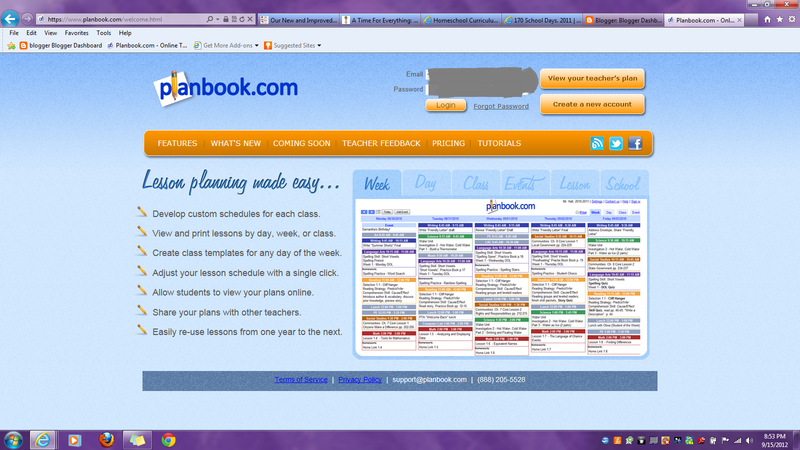 Planbook has given me a ONE year subscription to giveaway to a lucky reader of my blog. if you post about this on your facebook/blog or twitter account just leave another comment with a link of where you posted. You will than be given another entry. K had his first tennis lesson yesterday. They worked on holding their rackets correctly and how to drop the ball and hit it all within the first 10 mins of class. I didn't get a photo but they also worked on hitting the ball coming over the net; at a slow speed of course from the instructor. The last few minutes of class the kids grouped up and played a little of doubles. Fun to watch the newbies playing. A few weeks ago we did some standard weaving with paper which caused me to do some thinking. Today I cut some paper strips and showed K how he could weave paper. He thought it was neat and wanted to learn how to do it. He picked his paper and we started weaving. Here is K's finished paper weaving strip. I saw his creative wheels turning. Wasn't long before he was hauling out some construction paper, googly eyes, stars and grabbing his scissors and glue. Meet googly eyes robot and now he wants to make a video with him. This week we pulled out the paint and started to learn about the color wheel. We started with a talk about our 3 primary colors. K filled his cups and while doing this he was listing things of that color. Such as a red apple,fire truck.the sun,banana, the sky and so on. I than had already prepped a blank coloring wheel, that he would fill in with paint. Now that the Primary colors where done we talked about mixing colors. Before actually mixing the colors we did some guessing of what colors we were about to make. We than started the mixing. I lead him on this one but he got to add the amounts of each color and do the mixing. As he did this we again listed things that share the same color. Pumpkins,grapes and palm trees (LOL only my kid) were his main answers. Of course we painted our intermediate colors onto the color wheel as well. 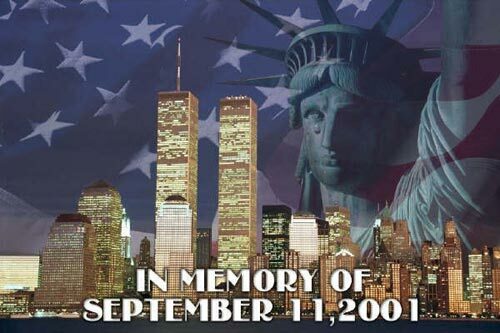 We wont forget this day! On Fridays we don't pull out the workbooks. Instead I pull out centers, which are fun learning games! Here are a few of the math centers we have for Friday funday. This game is a hoot! Trying to make seven with your cards and whats been played. skip counting mazes. I heard a lot of Hey that's not right every time he had to switch directions. we teach our kids to count going from left to right. Make them think when they suddenly have count in the opposite direction or up and down as the number builds. Math centers can be FUN! We started our frog study this last week for science and it's been fun. We're going to working on learning about frogs for a couple of weeks so stay posted to see what we've been up to. We started with this short reader. As we read through the book I had k find the stage in which we were reading about. to make it fun I had hid the 4 stages in beads. Look and Find was fun! Once we read the book and talked about the book I sent K over to the table to make a map all about frogs from memory. Being homeschooled year around things somewhat blend together but 9/4 was our official day. We took a week off before so this made the day stand out just a little bit. Perfect time to change our school routine up a little bit and get back onto track with a full time schedule.